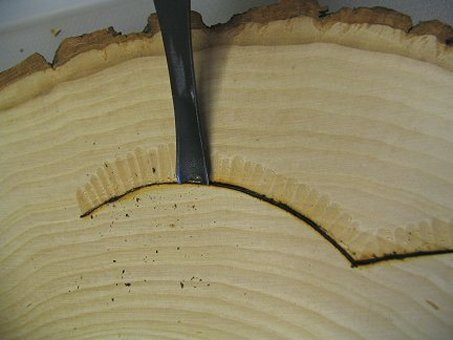 In this issue I thought we'd take a bit of a closer look at using a pyrographic machine to aid in carving a shallow relief object before burning it. 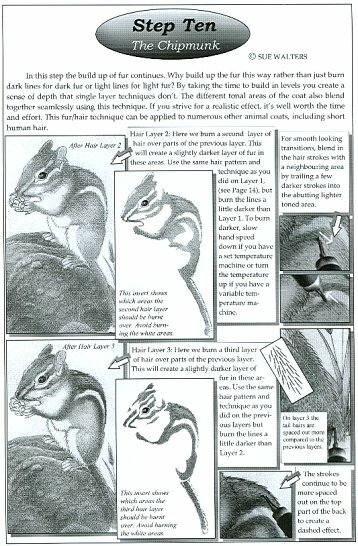 This is an interesting method to help add depth and an extra dimension to your work. 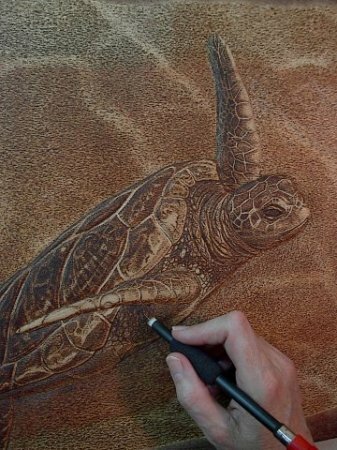 I'll step you through the carving process to show you just how easy it can be, even for the complete novice, and we'll take a look at this method being applied to a piece called 'Turtle Rising'. 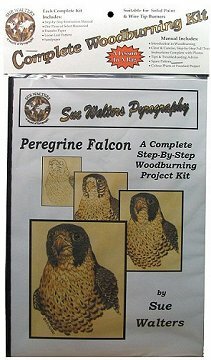 Also, I'll be introducing the Sue Walters Pyrographic Lesson Kits and my new book, Wildlife Designs. Both projects have taken an enormous amount of time and effort. When I decided to write the book and develop the Lesson kits I set out, as usual, to cram in as much quality and quantity as possible. 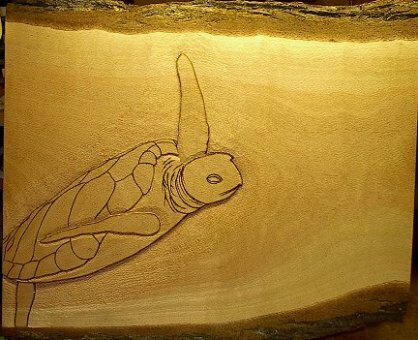 I'm happy to say that I believe I've succeeded:) Like the Pyrography Workbook, you'll find loads of material and projects to both help stimulate the creative juices and to inform you of my pyrographic techniques. Lastly, thanks so much for your continued patience at the lack of regular Pyro Newsletters. Some of you know I am a carer for my mother, Alison, and that coupled with other obligations, have kept my time at a premium. I, as always, hope things improve in the near future. Thanks for hanging in there. DO YOU KNOW SOMEONE WHO WOULD WANT TO SUBSCRIBE TO MY NEWSLETTER? They can sign up by clicking the link below. Please note that some spam security settings can prevent the Pyro Newsletter from getting through. Please be sure to add pyro_news@iprimus.com.au and suewalters@iprimus.com.au to your 'friends' list. 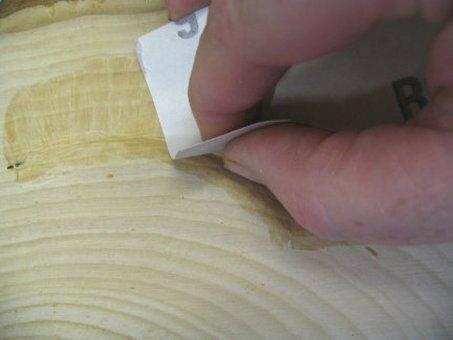 Many of us recall receiving a woodburning kit in our younger years and finding countless hours of pleasure burning the prefab patterns supplied within. At the time this was considered to be a child’s toy...a hobby for the young. But now, years later, the art of woodburning is becoming an ever increasing artform for craftsperson, carver & artisan alike. Persons worldwide have taken pen to hand to explore the possibilities of this intriguing artistic expression. And yet, in spite of this, there seems to be very little project material in the marketplace for the aspiring burner...until now. The prices of Canada, Australia & U.K are listed in LESSON SALES next to each kit. A 15% discount also applies to the price if all 4 kits are purchased at once. These kits offer you a full Lesson-in-a-Bag! 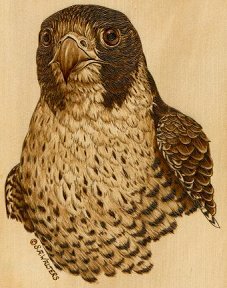 Peregrine Falcon - Kit#1: This dynamic portrait study brings to life the stark beauty and stateliness of the majestic bird of prey. The intensity portrayed in the eyes truly reflects the silent, strong nature of these regal birds. 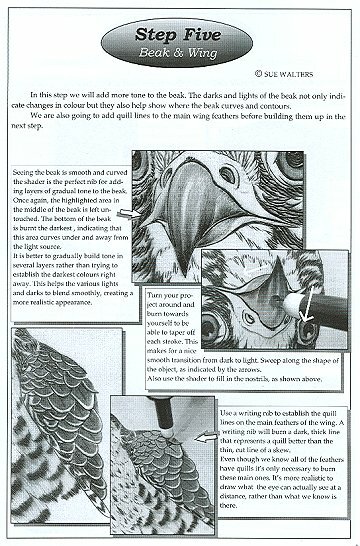 Photographed demonstrations illustrate how to create realistic feather formations using specific shading and highlighting techniques. Chickadee and Pine - Kit#2:This familiar backyard scene is a favorite of bird lovers everywhere. All the nuances of portraying a soft, delicate songbird are explored. The pine cone and needle setting plays an intricate part of this pattern as well and is defined with the same detailed clarity as the main subject...creating a fully rounded portrait of the quintessential songbird in nature. Chipmunk On Rock- Kit#3:)The chipmunk is that cute and whimsical creature we so often find paying a visit to our quiet walks in nature. Here we find him perched on a moss covered rock with the day’s lunch in his delicate hands. This lesson will explore methods of fine fur texturing that will make this little fellow appear a mere touch away. Full description will also be given to burning a highly realistic rock, moss and foliage setting to complete the image in its entirety. 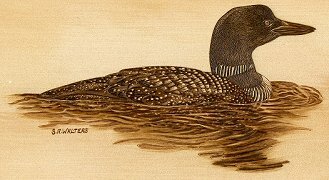 Loon On Water - Kit#4:Nothing personifies the tranquil solitude of the wilderness more than the sight and sound of the common loon on water. He is a lone spirit of the placid lakes, his body carving a gentle rippling path through the water. This study will provide a lesson in burning this distinctive bird in it’s natural habitat...upon rhythmic waves...his soft reflection adding that extra touch to bring this peaceful scene to life. Several new and exciting project kits will be designed and released on a regular basis. The following list names just a few subjects to look forward to in the Wildlife Series. In addition, other series, such as Rural Scenes will be explored in the near future. 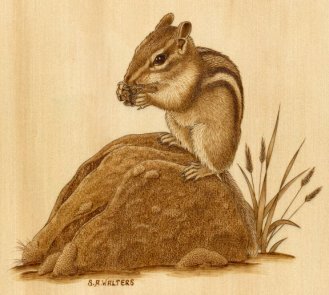 Why Sue Walters Woodburning Kits? With these affordable all-in-one kits, I will introduce the burner to subjects that will specifically concentrate on areas and elements that are sought after and on techniques difficult for burners to master. 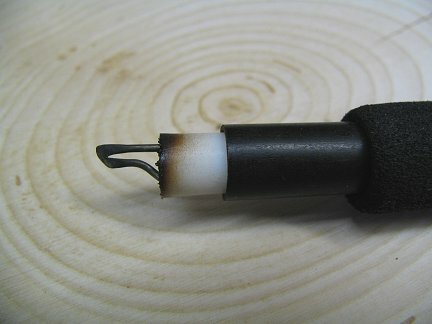 The woodburner's arsenal will be expanded with any individual kit as each one is designed to teach entirely new elements and techniques within that project. After completion, no matter what your favourite subject or level, you will be left with skills that can readily be applied to your future burning projects. Also, the originally designed pattern and instructions are yours to keep, allowing you to complete the project as many times as you like; for fun, gift making or profit! The kit is suitable for Solid Point or Wire Nib burners. Shipped from Canada for North American/Northern Hemisphere clients to provide rapid delivery and low cost shipping. Shipped from Australia for Australian/N.Z.and Southern Hemisphere clients to provide rapid delivery and low cost shipping. The kit is handsomely packaged in a clear poly bag, making it ideal for gift giving. There will be ongoing development of new kits that are focused on what the pyrography public have been asking for. There will be no extraneous/inflated handling charges. You will be charged for package material and postal rates only. The link below will take you to a Kit Sales Page. 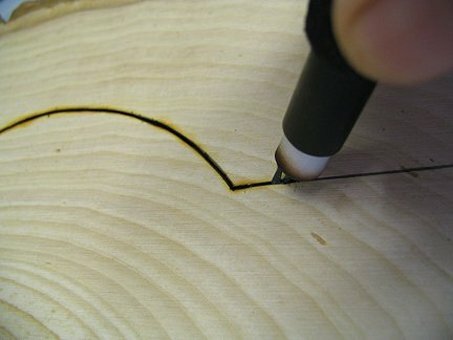 A skew is the nib in your kit that burns a crisp line....it's designed to cut the surface of the wood as it burns. They come in various shapes but the one thing they all have in common is they all have a sharp, knife like edge. An example of a Skew Nib. Heavy duty Skew is best. Seeing I was going to burn the relief carving, I decided to use a skew at high heat to burn my stop cuts. The heat aided in the cutting process, allowing me to sink the nib in deep and quickly without too much pressure. Not only this, but cutting around curves and turning tight corners was a breeze. The high heat burnt a path for the sharp nib to follow. A turn of the burning pen allowed me to easily and neatly follow a curved line. And, because little hand pressure was needed to push the skew, there was less danger of it accidently over shooting a corner. I found that I had to run over the line a few times to reach deep down, but the entire process only took me around 45 minutes all up for Platypus Diving. 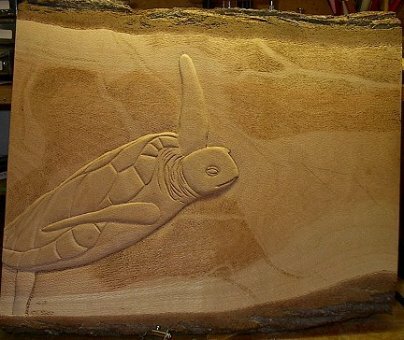 It did take me slightly longer for Turtle Rising because I wanted to carve a deeper relief on that project,thus needing deeper stop cuts. Once I reached as deep as the nib shaft would allow, I set to carving away the surrounding wood with chisels. 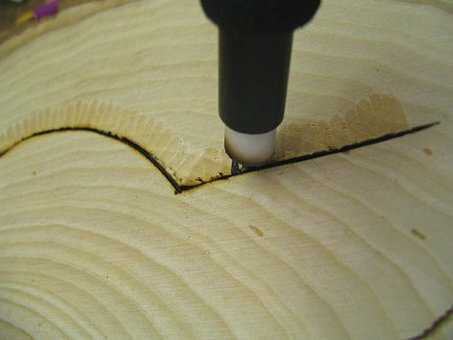 Once this was done I would burn the stop cuts again to sink them lower...then re-carve, and so on until I reached the final depth desired. Instead of writing more now, I will fill you in on the process with the aid of pictures below. All in all I found it an easy, fast and effective technique. I think it's well worth a try. The relief carving added a different dimension to these two projects and there is no doubt that carving marries beautifully with pyrography. Even the most simple project could benefit. 1) First cut. Follow the edge of the design with the skew on high heat. Move smoothly at a pace that will allow the nib to sink in deep. 2) First Gouge. 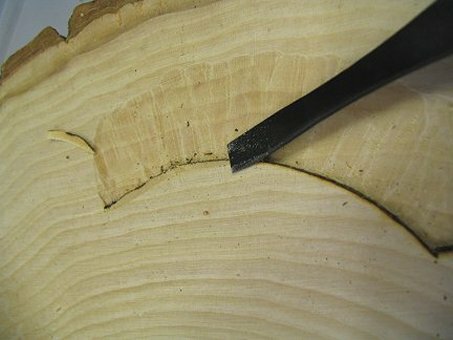 Use a gouge or other carving tool to remove the surrounding timber, up to the stop cut. 3)Second Cut. 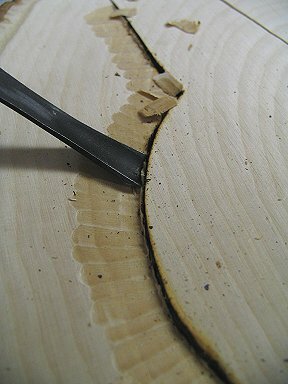 Because I wanted to carve deeper, I burnt a second level of stop cut. Don't forget to hone your skew nice and sharp. 4)Second Gouge. Gouging away more wood from around the design after the second stop cut burn. 7)Smoothing. 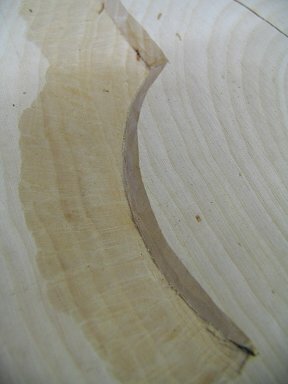 After going as deep as I needed I now use a broad gouge to level up the surface as much as possible before sanding. 8) Removing the scorched area. 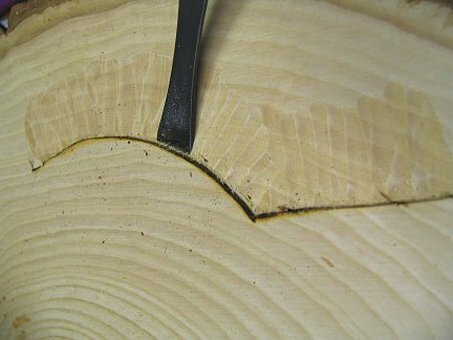 I decided to removed the burnt remains with a chisel to give me an even raw surface to burn on. 9)Rounding The Design. 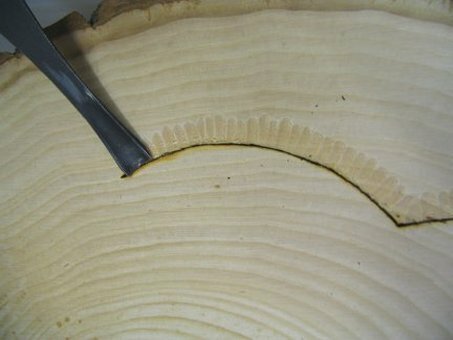 The edges of the design are then rounded with a chisel to help it blend naturally into the surrounding wood. 10)Sanding. After further rounding with a chisel, I sand the area smooth, ready for burning. 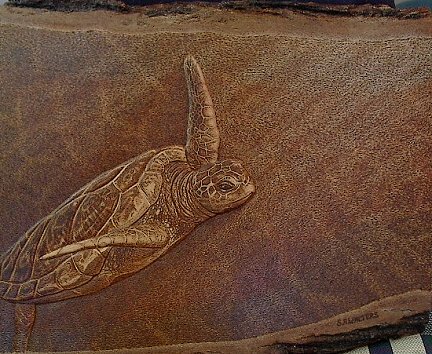 Let's now see how Turtle rising comes to life using the same Pyro-Relief technique. After the stop cuts and before rounding the design. After rounding the design and sanding smooth. The pyrography phase begins. Turtle is nearly finished but the water still needs to be darkened more. 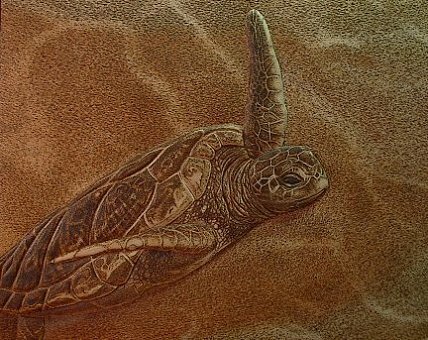 Burning dark shading to the under side of Turtle to emphasize the shadows. This gives the viewer the impression of light coming from above. 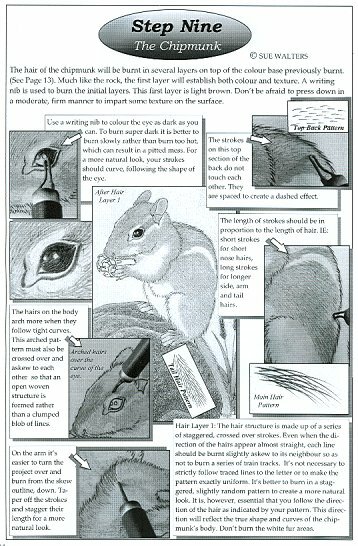 When I was asked to write a book of wildlife patterns I initially intended them to be only applicable to the craft of pyrography, after all, that's what I know best. But as I was producing the designs it occurred to me that each pattern could be as equally useful to many other crafts, multiplying the usefulness of the book many times over. I then set out to not only produce 30 dynamic wildlife designs, (and 10 border designs) but to also show the reader how to adapt and manipulate the designs for use in other creative mediums. The 30 full page wildlife designs are rendered in both line and tone patterns. The book explains how each pattern type is best used and the crafts they can be applied to. 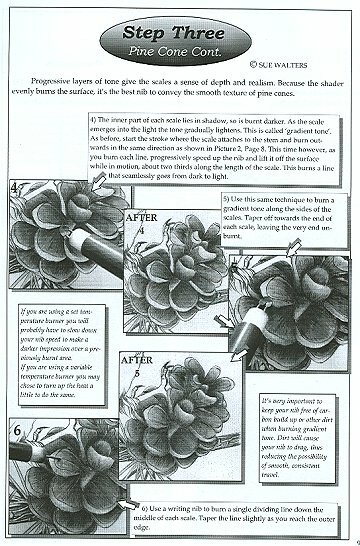 It goes on to further explain how these patterns can be further adapted for use in specialty crafts, such as chip carving, relief carving quilting, stained glass etc. I also included a chapter on using the home computer to modify and manipulate designs in order to create many new patterns and increase their versatility. Of course, all of this information is not just applicable to the patterns in this book, it can be used in years to come whenever you are using patterns or making your own. Finally, to prove the theory, myself and some friends selected one design and applied it to several crafts. The gallery in the book shows the results and gives a summary of how the pattern was used in each case. Problems or want to contact the site manager?Click here.